Keaton Grainger wins an aerial duel. Photo: Stephen Willmer. Skegness United booked their place in the Challenge Cup semi-finals after a 5-1 win at Colsterworth. The United made their longest journey of the season, but it paid off. Buoyed by last week’s win against title rivals Woodhall Spa, Skegness looked to continue their good form in the cup. The game also also saw the welcome return of Jack Minor in goal following his injury lay-off. The game began in a lively fashion, with United taking the play directly to Colsterworth. Lots of neat, passing football opening up the Colsterworth defence and kept them on the back foot. It only took five minutes for the deadlock to be broken. A break by Danny Wilkes was halted when he was felled in the area. The same player stepped up to convert the resulting penalty by sending the keeper the wrong way. This goal gave United the edge they needed and to continue with their pressing style of play. On 14 minutes a poor clearance by the replacement Colsterworth keeper was intercepted by John Courtney, who cleverly chipped him from distance to make it 2-0 to United. At this point United were firmly in charge and a constant threat to the Colsterworth goal. A long clearance by the home keeper was collected by the Colsterworth midfield but the run was halted when a free kick was awarded. From the free kick the Colsterworth forward hit the free kick of his life and it flew into the top of the net. This gave the home side a lift and prompted them to push beyond their own half. Colsterworth were playing an attacking style using both wings, but the United defence held firm. As the second half re-started, United were looking to tie the game up and continued to press, but at times their passing let them down. Too many misplaced passes gave the home side more of the play than United would have liked. The two-goal advantage was restored on 68 minutes when the ever-dangerous Kurt Crossley was picked out by Courtney after some great work on the left. Crossley side-stepped his marker and fired home in to the corner of the net to make it 3-1 to United. The introduction of Zak Bray and Karl Minor for United only piled the pressure on the home side as the running of Bray was too much for the defence to cope with. United increased their lead when, after another tricky run, Bray was tripped on the edge of the area. Courtney stepped up to place the resulting free kick neatly into the corner of the net for his second and United’s fourth of the game. By this point, the home side were tiring and the United front line were causing endless problems. On 85 minutes, Bray got his reward as he was well-placed to slot home the measured pass from man-of-the-match Crossley. UNITED: J. Minor, Kendrick, Grainger, Wager, Lyall, Mansell, Crossley, Hardy (K. Minor), Charles (Bray), Courtney, Wilkes. Hodgkison’s Man of the Match: Kurt Crossley. 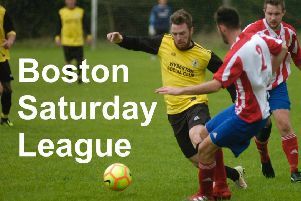 On Saturday United welcome fellow Workforce Unlimited Division One title challengers Boston College to the Grammar School (KO 2pm).